When it comes to your vehicle, you’re picky — and you should be. You want it to look a certain way, and you want to make sure the process of achieving that look is done professionally so it will last for years to come. Maybe you’ve considered having your vehicle repainted, but there’s a problem — repainting can take a great deal of time and cost a great deal of money. That’s why more people than ever before are opting for vinyl wraps, window decals, and perforated window wraps. First, let’s talk about vinyl wrapping. With this process, a thin film of vinyl is painstakingly installed on the body of your vehicle. It can be applied to the entire body or just a single panel. The vinyl wrap is strong enough to protect your vehicle’s paint from rocks and other debris on the road, and it can be customized with a wide variety of colors and designs to show off your business just the right way. Along with vinyl vehicle wrapping comes perforated window wraps and window decals, where a design or message can be applied to your windows. These window decals are designed to appear solid from the outside, but they are transparent on the inside so that your eyesight is never compromised during driving. So what’s the catch? Vehicle wrapping and window decals need to be installed very precisely. At Evolve Graphic Solutions, we’ve been doing precisely that for more than five years. Ready to see what we can do for your car or another vehicle with a professional wrap? Contact us online or by phone for a free consultation. How can we help your business be seen? Contact us online or by phone to take advantage of our free same day estimates. 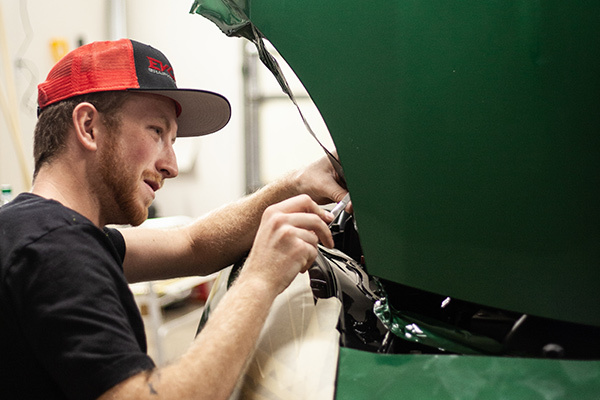 As a certified 3M Preferred graphics installer and by using 3M knifeless tape, we’re able to deliver a finished product that’s flawless every time.